The best features of the fruits and vegetables are the enzymes that nourish the body. 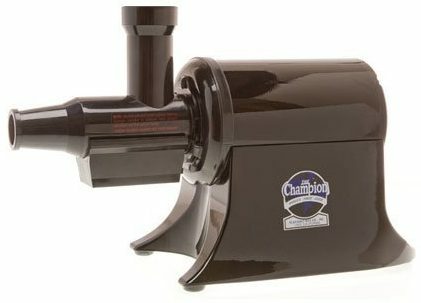 Regular centrifugal juicers rotate at high speed, generating heat while juicing. This heat destroys the enzymes in the juice, reducing the shelf life drastically. Masticating juicers rotate slowly at 80 RPM chewing through the vegetables and fruits to make the healthiest pulp free juice in a few minutes. Double auger juicers perform better than single auger juicers and they last longer. At the maximum, masticating juicers operate at 100RPM. It is better to choose a juicer that comes apart easily for cleaning. A compact juicer can be handled easily and stowed away inside a cabinet when not in use. 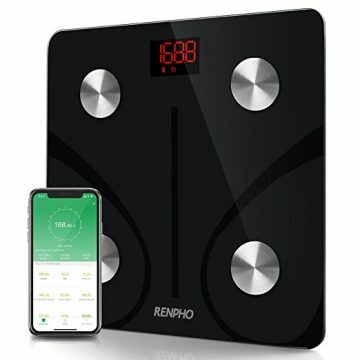 While purchasing masticating juicers, you should pay attention to the oxidation number which shows how long the juice can be stored to reap the benefits of enzymes. This masticating juicer makes 10% more juice than regular centrifugal juicers. The auger system performs three operations – squeezing, filtering and collecting. 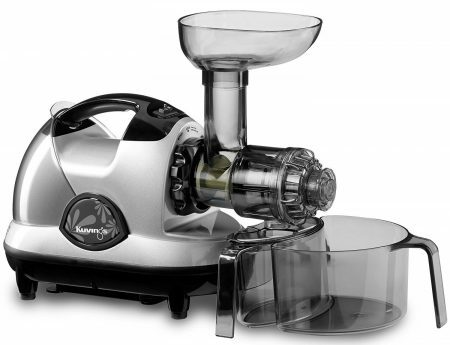 This makes it easy to disassemble the juicer and clean once you make juices. The juice bowl has an innovative 24 rib design for increased grinding performance. The motor operates at 65RPM at 150 W and creates lower noise. All the parts of the juicer are made of food grade antioxidant materials that can be popped in a dishwasher for easy cleaning. If you are bored of cutting the produce to feed through the narrow tube, you can make juice in a jiffy with BuySevenSide juicer with a wide feeding tube. The dishwasher safe parts can be detached and reattached easily after cleaning. It comes with a cleaning brush to clean non-removable parts. Using this juicer, you can extract as much as 98% of the juice. This juicer is super quiet operating at 49DB. This extremely popular juicer operates at a low speed of 80 RPM and prevents oxidation. You can keep the juice fresh and enzyme-rich for up to 72 hours. 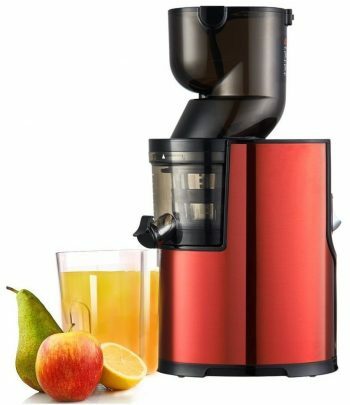 It has a dual stage juicing system that allows you to extract maximum juice from the fruits and vegetables. One of the special features of this juicer is that you can make nut butter, baby food, and soy milk. You can even use it to extrude delicious pasta and replace your coffee and spice grinder. It comes with several different attachments for various needs in your kitchen. 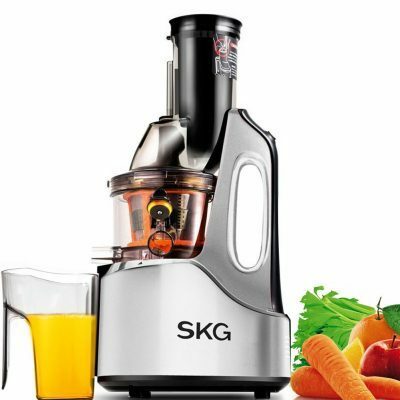 Compared to centrifugal juicers, SKG juicers are budget-friendly and operate at low speed. The wide chute cuts down preparation time as you don’t need to chop the ingredients finely. Its 240W AC motor operates at a low speed of 60 RPM. The juicer reduces oxidation, keeping the juice fresher for longer. This is made of TRITAN food grade materials with anti-oxidation properties. The juicer weighs 16 lbs and it stands proudly on your kitchen counter. 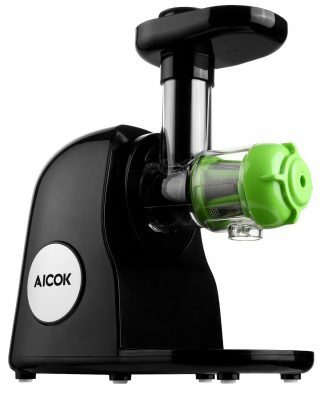 If you are looking for a juicer that fits your budget and lets you make fresh enzyme rich juice every time, then the Aicok juicer is the best choice. Operating at 80RPM, this juicer prevents oxidation and makes healthy juice. The auto pulp ejection feature allows you to continue using the juicer to make juice in large batches. The dishwasher safe parts are easy to clean and this juicer is quiet. You can juice all types of fruits and fibrous vegetables without worrying about clogging. The limited space in your kitchen doesn’t have room for bulkier equipment. 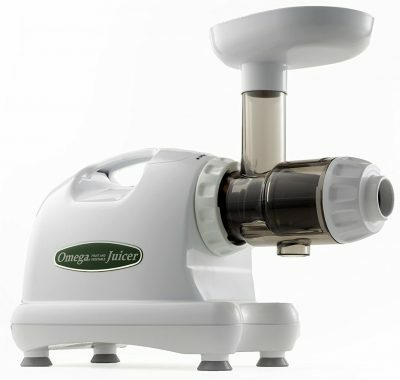 The vertical juicer from Omega is easy to store and use. If you have been drinking smoothies for so long, you won’t find it difficult to gulp raw juice with this amazing juicer. It delays oxidation and prevents the buildup of heat. It operates at a much lower speed of 43RPM and it has an auto-cleaning system. The upgraded auger system has a tighter fit, resulting in a high yield of juice. This is a highly dependable domestic juicer that has all the features of a commercial juicer. The single auger construction with auto pulp-ejection is just what you want to make healthy juices at home. 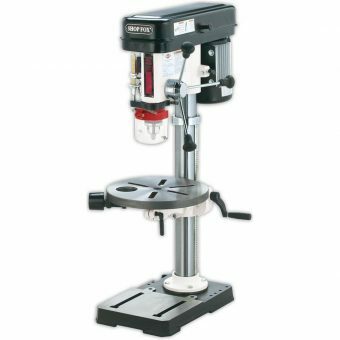 It has a 1/3 HP electric motor and the motor shaft comes with a 10-year warranty. 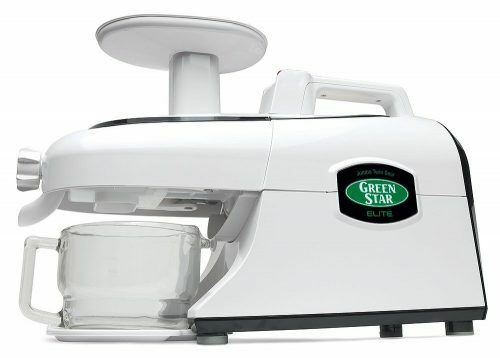 To juice wheatgrass, you need to use a separate attachment that comes with the juicer. Cleaning is a breeze and you can use a cleaning brush to clean the screen. Operating at a slow speed of 47RPM, this juicer makes the best fresh juice from any juice or vegetable with minimal oxidation. The dual blade augers make it possible to juice the produce quickly without any loss of nutrients. The mincing attachment converts this juicer into food processor instantly. You can make salsas and frozen desserts with a simple change of the attachment. One of the most useful features is the juice cap which controls the flow of juice during the juicing process. It makes it possible to premix juices and prevent spills. The magnetic twin gears made of stainless steel bio-ceramic materials delays oxidation while extracting fresh juice from various fruits and vegetables. The natural enzymes are preserved for longer as the juicing process delays the degradation process. The juicer operates at 110RPM and extracts maximum juice resulting in a drier pulp. The entire juicer is easy to assemble and clean. 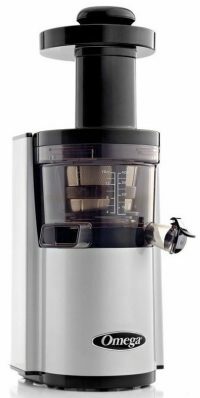 The homogenizer attachment doubles the purpose of this juicer as you can make salsas, frozen desserts, nut butter and pasta noodles. 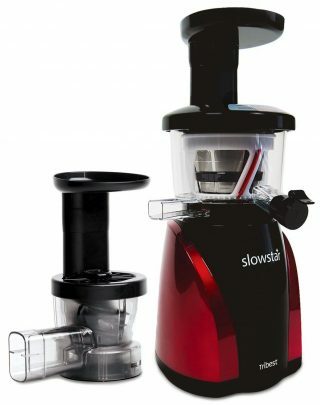 This juicer has a reliable 170 W motor that operates at a low speed of 80 RPM. 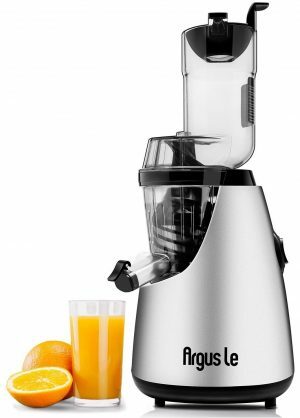 The nutritional value of the fresh juice is preserved by the antioxidant materials used in this juicer. The auto feeding design cuts down the juicing time. This is truly a versatile juicer with 7 different nozzles for food processing. The juicer system can be disassembled for easy cleaning.